Hello again, I’m Don Milne, your ROADTRIP-'62 ™ traveler. This is still the first of our ROADTRIP-'62 ™ routes, and we are traveling US-23. In 1962 it ran from Mackinaw City, Michigan to Jacksonville, Florida, so we’re getting near the end. We’re trying to travel America as it was in 1962, leaving today from Forsyth, Georgia. That’s seventeen days out from our beginning point and we won’t be on any freeways today. There weren’t many freeways in 1962, as the country had just begun building the Interstate system, so we’ll travel the two-lanes through every little town in mid-Georgia. At any time, click on an underlined word below to learn more about the places on the trip. Time to buckle our seatbelts and go! For breakfast, I believe I’ve found an old place: the local Waffle House. This chain of yellow-themed buildings began with partners Joe Rogers, Sr. and Tom Forkner in 1955. 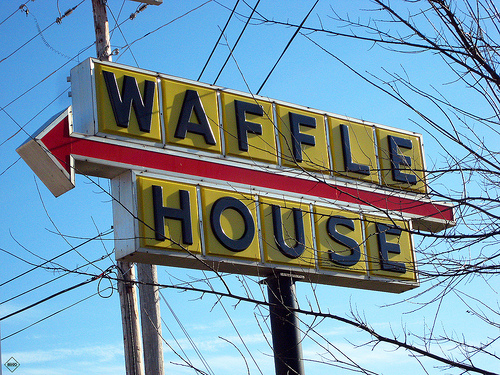 The first Waffle House restaurant opened in the Atlanta suburb of Avondale Estates and two years later they opened Unit 2. There were four by 1961 and though I can’t be sure the Forsyth restaurant was opened by 1962, it is near enough to Atlanta to be among the earliest of the next 44 restaurants opened during the 1960s. You can now choose from over 1,500 restaurants in 25 states. Waffle House has a recent claim to fame as being ranked in the "Top Five" of "Around the Clock Eats" on the Food Network. I’ve always loved waffles for breakfast anyway, so I’m trying their namesake menu item. And, they serve a pecan waffle: you can’t go wrong there! To go with waffles, I usually have bacon. Waffle House says if you lay end-to-end all the bacon they serve in a year, it would reach from Atlanta to Los Angeles seven times. That’s a project I want to help with! Macon, Georgia is our next stop. It was established at what I remember from school as the "fall line." This is a line where the land elevation changes rather abruptly, as Upper Coastal Plain rises to meet the higher plateau of the Piedmont. Many cities in the Atlantic states were set along this line, because the rivers generally have rapids or waterfalls that allowed mills to be constructed to use the water power. For some rivers, including the Ocmulgee River, this was also the end of the navigable portion, where shiploads needed be broken down into wagon loads. In the case of Macon, the location has continued to be a transportation hub even as river transport was eventually replaced by rail and now interstate freeways. Even airports have played an important part in industrial and retail growth here and a population boom that ended about 1960, due to Robins Air Force Base being nearby in Houston County since 1941. This is another place we could have heard the sonic boom of jets back in 1962 and the base is still open today. Because of the growth, Macon acquired some museums during the post-war period. I’m stopping first to visit the Museum of Arts And Sciences, which opened in 1956. It’s conveniently located right on old US-23 as we arrive in town. This is Georgia’s largest museum devoted to the arts and sciences and its mission is to cover the entire field. There is fine art, natural science, a mini-zoo and even a trip to outer space here! We won’t be in town for the evening show, but there is often an afternoon show at the Mark Smith Planetarium. Of course the type of show has changed since 1962, where we would probably have seen only the star simulations with some narration and music. Today they use computer animations mixed with real photography from both Mars and orbiting spacecraft. If you don’t want to see another planetarium show, how about a whale? The museum has on display a fossil skeleton of a Zygorhiza found in a kaolin mine in Twiggs County, Georgia. It is estimated at 40,000,000 years old; clearly the oldest thing we’ll see on this trip. At the time it was installed here, it was the first animal of his species to be put on display in the world. Other levels at the museum have three floors of interactive exhibits exploring art, science, and the humanities. The main level has some of the permanent collections including butterflies, arrowheads, and dolls. Outdoors, the Mini-Zoo has a variety of animals, approximately 70, including invertebrates, amphibians, reptiles, birds, and mammals in various habitats, all surrounding a man-made banyan tree. However, the outdoor Grounds Collection is new, with recent sculptures and the Kingfisher Cabin that was relocated here in 1964, and restored. Another museum that’s old enough for us to see is the Hay House. 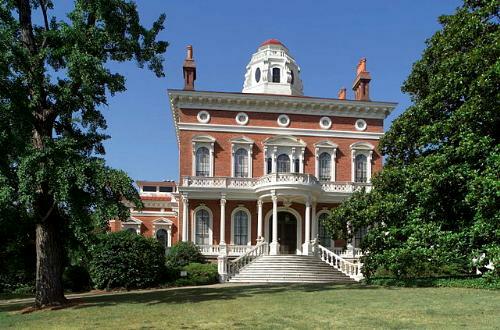 This 16,000-square-foot mansion has four levels and is topped by a three-story cupola. It became a museum after the death of Mrs. Hay, in 1962. It dates from the 1855-1859 period and included many technologies not often seen at the time, including hot and cold running water, central heat, a speaker-tube system, in-house kitchen and ventilation system. The Hay House is always undergoing research and restoration, and visitors often have an opportunity to see both. You can take a guided tour where docents discuss the national significance of the home’s architecture, its technological advances, and the three historically significant families who lived here: the Johnstons, Feltons and Hays. In the house's decorative arts collection you will see stained-glass windows and handsome cabinetry. The Hay House, together with all the other historic-looking homes here, may cause you to wonder why there are so many. Well, unlike Atlanta, which was burned during the Civil War, Macon passed through the war nearly untouched. There was only one assault on the city and it was completely unsuccessful, resulting in a single cannonball falling in the city. The site where it fell is now known as the Cannonball House and it’s right across the street from the Hay House. This is also a museum home open to the public, but it appears not to have been in 1962. Due to this relative safety, Macon served as a Confederate gold depository, arsenal, and armory. It also held a prisoner of war camp and many hospitals for wounded soldiers. Thousands of people from the surrounding countryside took refuge here and at the end of the war, General Howell Cobb made a prompt and cooperative surrender. The Union troops occupying the city therefore did not destroy it, resulting in Macon now having over 5,500 National Register historic structures in 11 historic districts. Now or in 1962, we can spend some time just driving around town to view these buildings. I’m actually going to skip the smaller Cannonball House, though you may wish to stop. This house is typical Greek Revival architecture of the old South. It has a museum with a Civil War military collection featuring officers' uniforms, company flags, swords, and guns. Other period pieces such as furnishings from the founding of nearby Wesleyan College are also on display. Macon also has a number of newer museums: we won’t be stopping at the Georgia Music Hall of Fame, Tubman African American Museum, or the Georgia Sports Hall of Fame. The Georgia Music Hall of Fame closed in June of 2011 anyway. But we will be stopping for lunch! I should be able to find something old in downtown, as there are plenty of restaurants here. For instance, the Marco Ristorante Italiano at The 1842 Inn is in a very old building, but too expensive for lunch for me. Then there’s Len Berg’s, in business since 1908. They are open for lunch only and serve Southern favorites such as turkey and dressing, fried catfish, homemade fresh peach ice cream and Southern style vegetables. But today I’m feeling like a small hole-in-the-wall joint and the original Nu-Way Weiner stand on Cotton Avenue is just right. It’s been here since 1916, and since then James Mallis’s chili dog has become an eating obsession. Nu-Way is right on old US-23, occupying a skinny building with booths down one side and the counter on the other. The neon sign is even still in operation and goodness knows you don’t see enough of those today. Their most famous serving style is known as "all the way", which means with mustard, onions and chili sauce. Nu-Way makes its own secret recipe chili sauce and has its own private label weiners. Other choices include the Scrambled Dog, which is an open-faced hot dog platter served with their chili with beans. And I can get my favorite soda, Dr. Pepper: these folks are already doing something right by me! 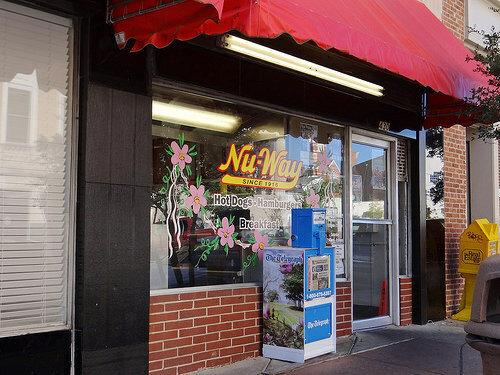 Gourmet Magazine declared Nu-way "One of America’s Ten Best Hot Dog Joints"; they’ve also been featured on the Travel Channel’s "Hot Dog Heavens." Their slogan is "I’d Go a Long Way For a Nu-Way", which we have. Before we leave town, we also have to take a look at music history, because Macon has been home to several icons of music. And, not all of the music history along US-23 is country music. The historic Douglass Theatre was a showcase for African-American talent since the 1920s. It was a rare movie theatre and vaudeville hall open to African-American citizens. It was founded by Charles Douglass, organizer of the Minstrels and Comedy Company, and was part of the Theatre Operators Booking Agency network of over 40 theatres that was the major source of bookings for black performers. It hosted jazz and blues greats and comedy stars such as Butterbeans and showed films written and produced by blacks. The Douglass has solid connections to 1960s music too, beginning in 1958 with a Saturday morning live broadcast show called "The Teenage Party", by local disc jockey Hamp Swain. This show offered local performers like Otis Redding and Little Richard the opportunity for exposure in the late 1950s and early 1960s. 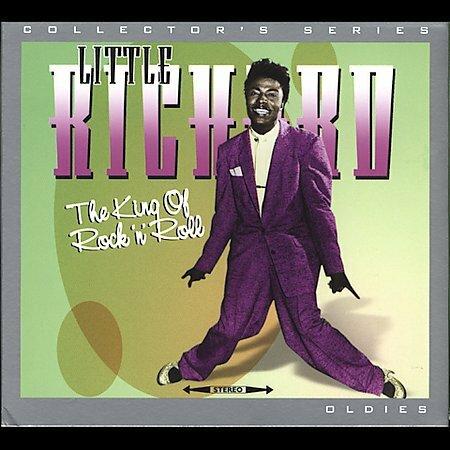 Little Richard was born as Richard Wayne Penniman here in Macon on December 5, 1932. His signature song, "Tutti Frutti" was recorded in 1955 and established his style as runaway piano and over-the-top screams laced with sexual innuendo. He was heavily steeped in gospel music while growing up and took a break from performing for several years between 1957 and 1962 to preach, but returned to the business, touring the next year with the Beatles in Europe. James Brown recorded his first single "Please Please Please" in Macon in 1955, adding to the city’s music legacy. In May of 1962 he hit #35 on the charts with "Night Train." James broke into the upper levels of national music fame the next year when "Live at the Apollo" was released, which had been recorded on October 24, 1962. He had to finance the show and recording himself after his record company did not see any value in a live stage recording! Three other albums were released in 1962 but only "Apollo" was recorded that year. The Douglass closed in 1972 but reopened in 1997. Currently the Macon Film Guild has a film series and other groups run arts programs from the theatre. In commemoration of its legacy, let’s listen to James Brown’s live version of "Night Train" from 1963. And, as we exit Macon, we’ll stop at their outdoor site worth seeing, Ocmulgee National Monument. Like the Hopewell Culture National Historical Park we saw back in Chillicothe, Ohio, Ocmulgee shows monuments and artifacts of prehistoric human life in North America. Unlike Hopewell, Ocmulgee has been more impacted by recent human life. This is the only National Park property I’ve ever seen with an active railroad running right through the middle and an interstate freeway within the park property. The railroad was first built in 1843 and even had a locomotive roundhouse located near the Funeral Mound. Another line was added in 1874 destroying the mound. Additionally, in 1932, a large part of one mound was removed for use as fill dirt for Main Street. It was immediately following this that a group of local citizens decided the mounds were of historical significance and should be preserved. They sought assistance from the Smithsonian Institution, which sent staff to conduct archeological excavations. As that work progressed, Congress authorized Ocmulgee National Park and in 1936 the park was established as Ocmulgee National Monument. Even that didn’t stop further losses, as the freeway was constructed along the river in the late 1960s (we would not have seen this) destroying or damaging a number of important prehistoric and historic sites outside the park. Finally, an entire village site just outside the park was destroyed in the 1970s for construction of the Bibb County Sheriff's Department firing range. Nonetheless, evidence is here of over 12,000 years of human habitation, back to distinctive Ice Age "Clovis" spear points. Pottery from several ancient cultures is on display and other artifacts showing connections to the Adena/Hopewell Cultures we previously saw. Of course the most stunning artifacts are the remains of stone effigy mounds and earthen burial and temple mounds of the Woodland, Lamar and other cultures of the area. You can walk several trails in the park’s 702 acres and see remains of mounds and interpretive signs at village sites and more. In the Art Moderne style visitor center, some of the artifacts unearthed over the years are on display along with information on the cultures that produced them. At least we can enjoy what’s left while thinking a bit about how little we valued these ancient sites in earlier years. Driving through town you may have noticed a couple more US-numbered routes. We meet US-129 again, having last crossed it northeast of Atlanta. Now we will follow it south through Cochran, Georgia. And we briefly run with US-80, just to the east of town. This was the first all-weather coast-to-coast route for automobile travel and for a time was known as the "Broadway of America." It actually runs on Broadway Street for a ways within Macon. US-80 originally ran from San Diego, California to Tybee Island, Georgia and may be the only US-numbered route we cross that ends on an island. The portion west of Dallas, Texas was decommissioned beginning in 1964 and into the 1970s when I-8, I-10 and I-20 replaced it. The countryside we’re passing through this afternoon is all agricultural. Mile after mile of food: corn, soybeans, vegetables, melons, orchards, and peanuts. Even non-food crops like cotton, which is actually grown on more acres than all the rest. I always enjoy driving through flat farmland in late summer as the shades of green, shapes of the field plots, and the leaf textures create a very interesting landscape. 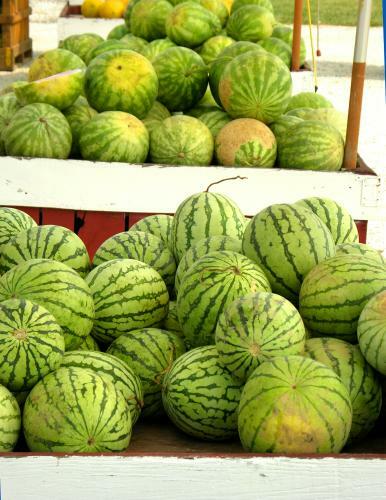 And, as with similar country back in Michigan or Ohio, we’ll see plenty of roadside stands selling the farm produce. In Georgia they not only offer the usual fruits and vegetables, but there are also peanut stands! Let’s stop and stock up some fresh goodies for the next couple days. Tonight we’re stopping at Eastman, Georgia, where the courthouse is on a circle, instead of the usual courthouse square. There are few motels here, but either the Sunrise Inn or Eastman Motel may be old enough for us. Although I’m staying here, I’m eating south of town at Carr’s Diner in Chauncey, Georgia. This is only 8 miles south of Eastman and I hear the food is worth the drive. I love a good catfish dinner and when you add in the Southern hospitality and dessert, this should be fun. I’ll have to check to see if they’ve been here since at least 1962, though. Back to the motel to watch some TV again tonight. One of my favorite shows from 1962 is still being aired, sometimes on the Cartoon Network and sometimes on Boomerang. 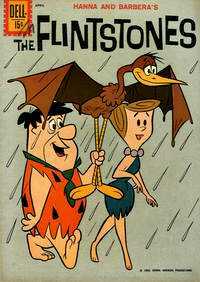 The Flintstones was first broadcast in 1960 and was well into its second season when 1962 rolled around. Strange as it may seem for a cartoon, it first appeared in black-and-white, though it went to color in 1962. None of the TV networks broadcast a full night of color shows until 1966 and we never had a color TV while I was a kid, so all my memories of it are kind of "colorized" from later viewing. The show was originally aimed at adult audiences and was shown in evening prime time. The first season was even sponsored by Winston cigarettes: you’d never find cartoon characters doing that today! I’m skipping the smokes and settling in for a "Yabba Dabba Do" time. Tommorrow, we’ll continue south on Roadtrip-'62 ™ .